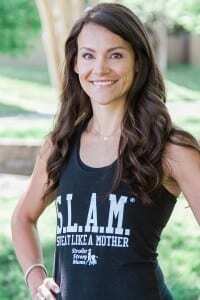 SLAM the Alarm classes are our mama-only classes created to accommodate working mamas and mamas to school-aged kids, but open to all of our members as well. These classes are 45 minutes long and you do not need a stroller to participate! Please meet at the basketball courts and bring your yoga mat, set of dumbbells and water! Free parking can be found in the lot by the playground, while you will find metered street parking as well. Also, within walking distance is the Pentagon City metro stop on the blue line. Meet us on the basketball courts near the restrooms off of S. Hayes Street. Plan to SLAM the Alarm rain or shine! If it is raining, classes will meet under the overhang at the community center near the playground. Please check back for winter schedule in December. Questions? Contact Kelli or Lindsay at slamdc@strollerstrongmoms.com. Nestled in a family neighborhood, Nottoway Park has everything we need for a killer S.L.A.M. session; basketball courts, tennis courts, and volleyball courts, a turf field for quick-moving stations some benches for all kinds of push-ups, and plenty of trails for our walking and running routes. There’s a great playground and swings for the littles to play on after we sweat! Plenty of free parking available at Nottoway! Meet us by the playground; just look for all the strollers! Bring a jogging stroller, yoga mat or towel, set of dumbbells, resistance band, water, snacks and toys for baby, and a need to S.L.A.M.! Located just outside Fort Belvoir gates, Grist Mill Park has everything we need for a killer SLAM session; basketball courts, lots of grassy open space for those stroller sprints, a turf field for quick-moving stations, some benches for all kinds of push-ups, and a great hill to strengthen our legs! Stay after we get our sweat on at the huge playground; one designed for older kids and one designed for the little kiddos! Free parking can be found in the large parking lots; meet us on the basketball courts. Bring a jogging stroller, yoga mat or towel, set of dumbbells, resistance band, water, snacks and toys for baby, and a need to S.L.A.M.! Located just south of D.C., Virginia Highlands has everything we need to get fit and strong: paved trails around and through the park for lunges, sprints, and runs, open grass areas for quick-moving stations, benches for all kinds of push-ups, both grass and turf soccer fields, and tennis and basketball courts. BONUS! TWO playgrounds and a splash pad for the kiddies (and us–to cool down!). Free parking can be found in the lot by the playground, while you will find metered street parking as well. Also, within walking distance is the Pentagon City metro stop on the blue line. Meet us by the playground and restrooms off of S. Hayes Street. Bring a jogging stroller, yoga mat or towel, set of dumbbells, resistance band, water, snacks and toys for baby, and a need to S.L.A.M.! Please Note: A $12 monthly indoor fee will be assessed for all clients who attend classes during the months of January through March. Keep Up With SLAM'n DC! Join SLAM DC on Instagram! Contact the SLAM DC Team! Kelli is an ACE certified group fitness instructor and is CPR/First Aid certified. She also holds her RRCA Level 1 Run Coach certification. She grew up active in baton twirling, dance, and track and has a degree in Special Education from Penn State. SSM is the perfect combo of fitness, teaching, and little ones-pulling all of her passions together. 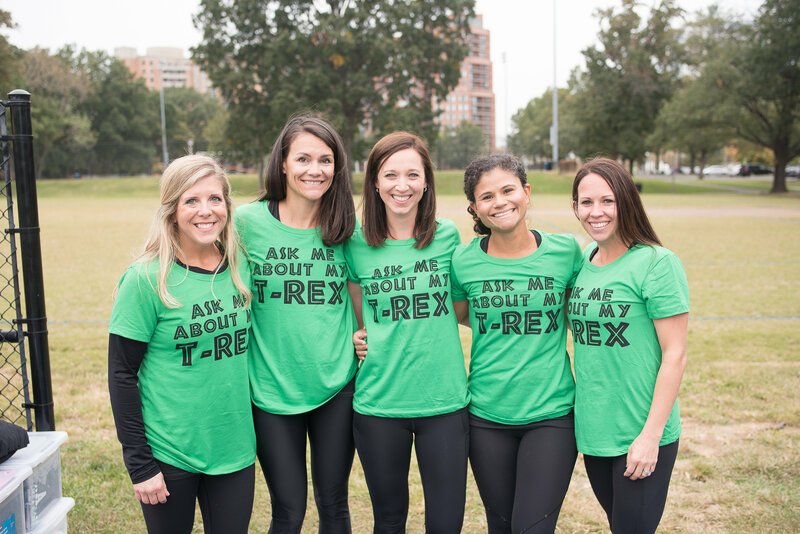 Through fitness, Kelli strives to create a community for moms that is unmatched in the DC Area. She started the SLAM DC affiliate in October of 2014 six months pregnant with her second child. Since opening, she has moved to Australia and Clarksville, TN due to her husband’s military career.. She feels lucky to have a strong business partner and instructors on her team to continue growing and fostering this amazing community. She’ll pop back and forth occasionally to sweat like a mother in our Nation’s capital – and cannot wait to meet any new faces! Lindsay is an ACE certified group fitness instructor and is CPR/First Aid certified. She also holds her 500hr level Yoga Teacher Certification. Additionally, she has 40 hours of prenatal yoga training and holds her RRCA Level 1 Run Coach certification. 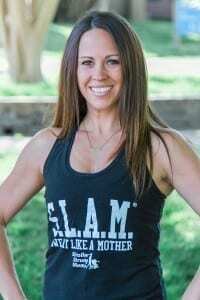 Lindsay has been an active member and instructor with SLAM DC since January 2015 and helped Kelli manage the business during her year overseas in Australia. She is now co-owner of this organization and is beyond thrilled to help spread the mission she is so passionate about. Mom to two boys, Lindsay loves to push her limits through racing, and craves the friendly competition and teamwork fostered in SSM. 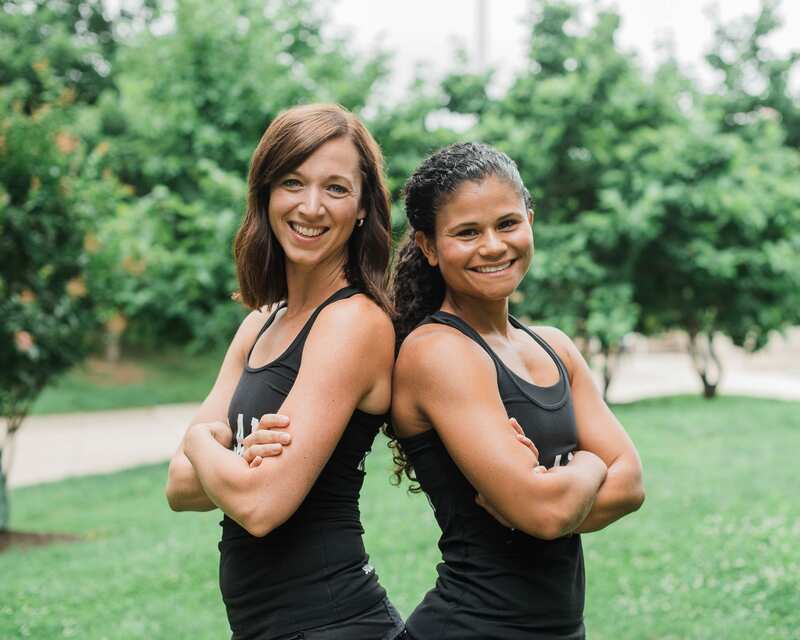 Local to the DC Area, you’ll see her bright, cheerful smile every day at classes either making you SWEAT like a mother, STRETCH like a mother, or just laughing and working out right beside you. Megan Brookes is an ACE certified group fitness instructor and is CPR/First Aid certified. She grew up baton twirling, dancing, and cheerleading. She has twirled at Penn State University and been a coach for both twirling and cheerleading. Upon joining SSM (with son, Peter in tow), she has found a passion for running and has conquered many running achievements in two short years. Her tough, creative classes will remind you that you can laugh AND sweat like a mother at the same time. Kate is an ACE certified group fitness instructor and is CPR/First Aid certified. She grew up playing tennis at a national level and went on to play on the varsity team at Virginia Tech. Kate is an avid sports fan and competitor and still enjoys playing tennis, softball, and loves to both snow and water ski. She brings her “work hard, play hard” attitude to class and loves that through SSM she can get a variety of high-intensity work outs all with her little one and SLAM mama friends right beside her. Lauren is an ACE certified group fitness instructor and is CPR/First Aid certified. She grew up playing field hockey, softball and cheerleading. Lauren also loves to run and has participated in the SLAM DC Ragnar team the past 2 years and is currently training for our third team relay race. Mama to a little girl, she brings enthusiasm and positive energy to every class and loves mixing things up with fun music, running and high intensity workouts. I think one of the most important things Stroller Strong Moms has taught me is that the scale is not my enemy…that my strength is the most important thing.